Coleen Garcia joins the public in sounding off their reasons why people "want Uber and Grab" instead of regular taxis. 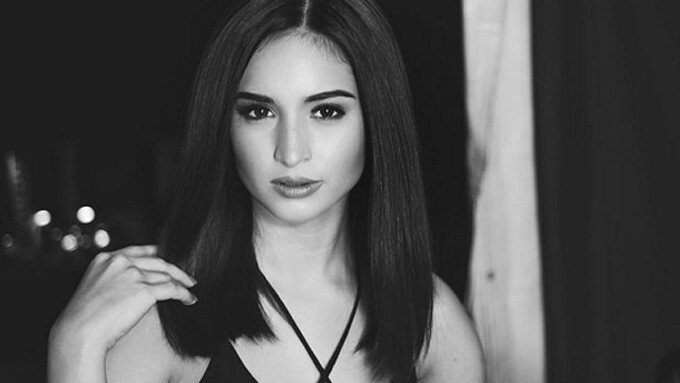 Coleen Garcia is one of the celebrities who strongly voiced out her disapproval on Land Transportation Franchising and Regulatory Board’s (LTFRB) order against ride-hailing services Uber and Grab. This order was done supposedly to guarantee the safety of the public, but it received a massive backlash from commuters who have found Uber and Grab the safer option rather than jeepneys, buses, PUVs, and taxis. 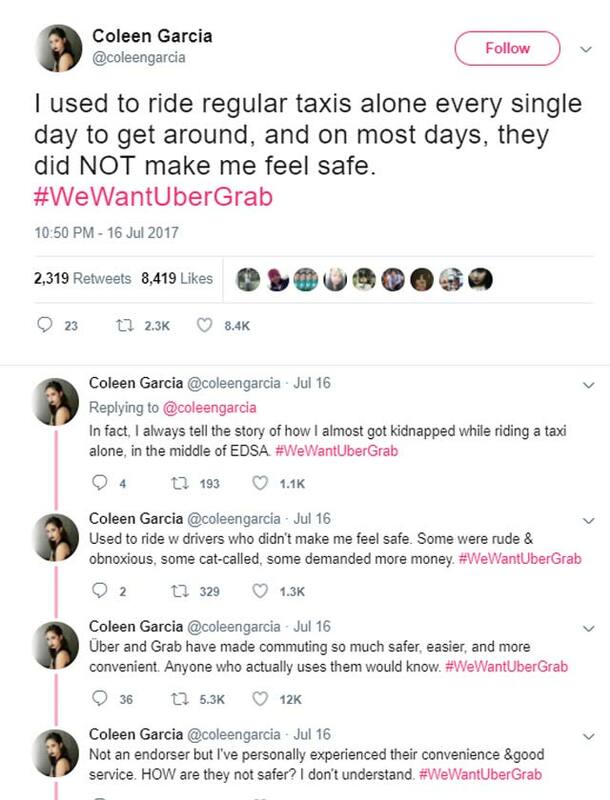 In a series of tweets using the hashtag #WeWantUberGrab, Coleen expressed her two cents on the matter. A netizen countered the points she raised by saying that these ride-hailing services sprouted "like mushroom that clog the streets of manila,” hence, they need to be regulated. 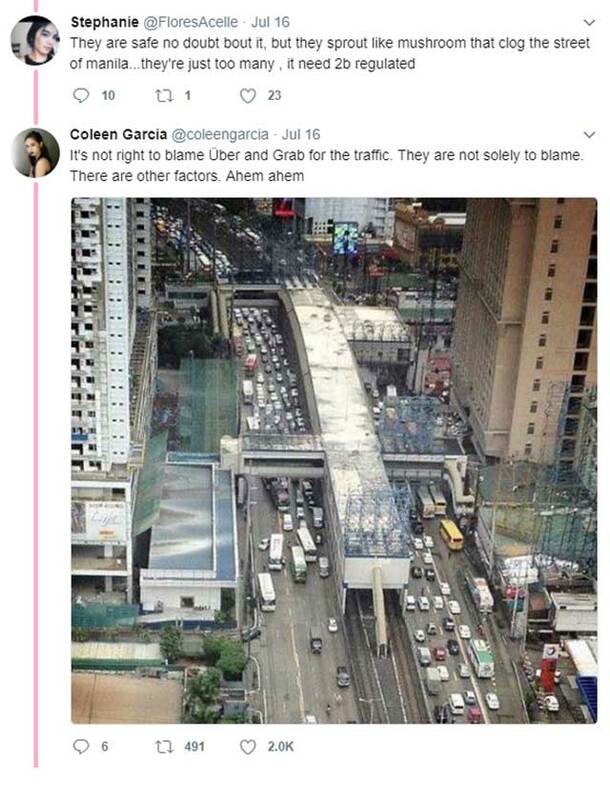 But Coleen quickly said that the Uber and Grab cars weren’t the sole reasons for the horrendous traffic situation around the metro, and posted a photo of EDSA showing four buses causing the jam. ALMOST KIDNAPPED. 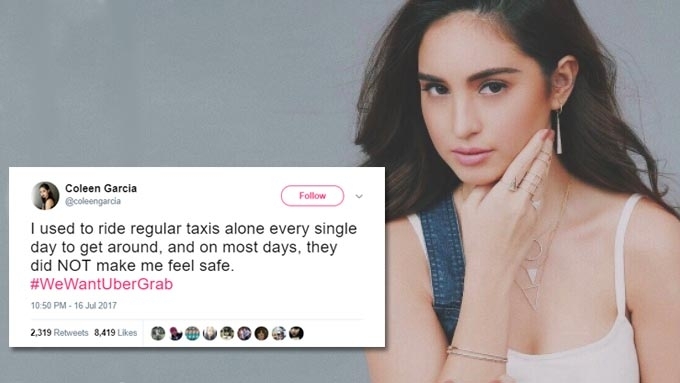 In her Twitter thread, Coleen also recounted her story about how she “almost got kidnapped” by a taxi driver while they were on EDSA. The 24-year-old actress first narrated this terrifying experience to Preview back in March 2016. Coleen used to commute from Quezon City to Alabang and vice versa to get to work. She was 19 years old when this incident happened. It was Christmas season, and hailing a taxi during that season was nearly impossible. On her way home to Alabang, Coleen was caught off guard when the cabbie suddenly couldn’t make the trip all the way to the south. He dropped the actress off at a “sketchy part” of EDSA. In her wave of panic, Coleen got the first cab she saw and forgot to note down the plate number. The driver insisted they take a detour to gas up. Coleen fervently declined, and asked him to find a gas station along EDSA instead. She was even willing to pay for it. But the driver could not be dissuaded. Coleen then asked to the driver to pull over, but still insisted on making that detour. Taking advantage of the bumper-to-bumper traffic, Coleen hurriedly paid him, and got off the car. The door didn’t budge at first, but she managed to get out of that shady situation alive.